Thundering Buffalo video slot game takes us back to a time when wild Buffalo roamed the North American plains in vast numbers. Native Americans believed the animals had special spirits and there was a spiritual connection with the animals. The sound of thundering hooves along with native drums will instantly set the tone for you. Like many games of this theme, the buffalo is the central character, both living and when killed for its meat and hide. This particular slot has an unusual reel format, as well as a multi-ways to win. Play Thundering Buffalo for free and get your head round the mechanics of this game before playing for real. Slots developers, IGT, who have been providing top-quality video slots consistently for years. The brains behind top quality offerings such as the ancient Egyptian themed slot, Cleopatra, and the movie-themed Ghostbusters have added to its arsenal a Native American-themed slot called Thundering Buffalo. Employing a similar dazzling 5-reel hexagonal system, the game pays 720 ways, and also pays right to left as well as left to right. The betting options are kept low, probably to encourage the casual slots fans, but with potential big wins, it’s no surprise they keep coming back for more. As with WMS’s hairy-beast themed slot, Buffalo Spirit, Thundering Buffalo sees you on the open plain facing a herd of rather aggravated looking beasts. Fearsome they may be, but the 3D animation and graphics are something to behold: line up buffalo symbols and see them start to charge towards you. Elsewhere making up the look and feel are night-time fires, wigwams, a range of hairy critters, and the familiar 10-through-Ace card symbols. Free spins are a big feature of the game: get five in order across the reels and you’ll trigger the Free Spins bonus, which can also be re-triggered. Even at the lower end of betting, $0.01, the freebies can add up to some big wins. The ‘WILD’ symbol is, helpfully, the game’s Wild, and is stacked. It substitutes all other symbols other than the Scattered bonfire or Free Spins symbol. Line up five and an incredible animated buffalo leaps out of the screen to give you a healthy win (and, presumably, a rather large headache). Wilds obviously play a big part of all slots, but with IGT’s 720-ways method, you’ll find that angry heffalump charging out a lot more than you bargained for. There’s a reason IGT’s unique feature has been popular all over the world: it’s a thrill and potentially can increase your wins, even starting from humble beginnings. Add that to some great animation and IGT can continue releasing MultiWay Xtra slots for some time with a pretty reasonable expectation of success down the line. 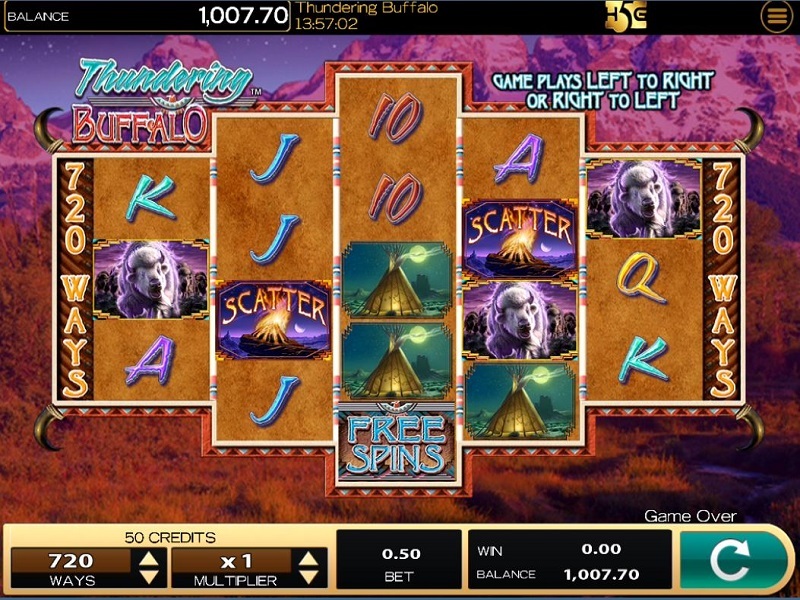 The video of Thundering Buffalo slot will give you some understanding of the mechanics of this slot game and also realise its different to the similarly named Buffalo Thunder. There are details about the various symbols within the game and how the features are triggered. Check out the video and learn about this IGT slot.